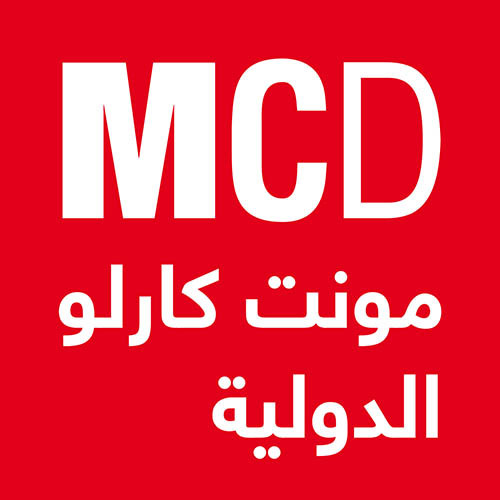 Legacy newsrooms face immense challenges in dealing with media ethics in the digital age, notably with competition from social networks and platforms, but have a responsibility to maintain their credibility and professionalism, Media Unlimited director Magda Abu-Fadil told Radio Monte Carlo Doualiya (MCD). In Part 2 of an interview on MCD, Abu-Fadil discussed the dilemma editors face in determining what photos, videos and text to disseminate when the content is sensitive, offensive and tragic. She pointed to a number of apps and tools used in verifying content to find out if it’s plagiarized. What’s key is to deliver information that’s accurate, balanced, that doesn’t deviate from humanity and that’s ethical, Abu-Fadil insisted, noting that critical thinking is very important but that many journalists don’t always use it in their work. Abu-Fadil advised journalists and news organizations to be completely transparent when mistakes are made and to admit and correct them immediately if they’re to maintain their credibility. She discussed the impact of “fake news,” “post-truth,” and “alternative facts” during a segment of the program “Digital” in February 2018 hosted by Nayla Salibi. Part 1 of the interview can be heard here. “We need journalists to tell the story and tell it well,” Media Unlimited director Magda Abu-Fadil told media graduate students at Lebanon’s Notre Dame University during a Skype discussion on journalism and its transformation. The virtual seminar “Journalism in the Internet Age: Trends, Tools and Technologies” November 15, 2017 began with a presentation reviewing Abu-Fadil’s evolution from an analog to a digital journalist in a career spanning over four decades. “Whether you’re using analog or digital tools, what matters is the content,” she told students of Rouba El Helou-Sensenig’s JOU 640 class. The discussion also focused on adapting journalism skills to incorporate technological changes like Artificial Intelligence (AI), Augmented Reality (AR), Virtual Reality (VR) and Mixed Reality (MR). Abu-Fadil explained how newsrooms must reinvent themselves just to keep up. She said what she could do with a large bag of equipment – cameras, lenses, filters, batteries, rolls of film, recorders, notebooks and more – she can now accomplish with a small smartphone, some pocket-size accessories, and apps. Media education in Lebanon needs revisiting as faculty members and curricula are often well behind the times leaving graduates unable to meet market needs. “The gap begins with curricula that resemble poems of the Jahiliyya (pre-Islamic) era,” said Media Unlimited director Magda Abu-Fadil who spent years trying to upgrade courses at two universities in Lebanon but was often met with academic and bureaucratic obstructionists. She said many of the instructors teaching journalism and media courses had never worked in the field and had never run newsrooms, leading to a disconnect between academia and the media to fulfill job requirements. Abu-Fadil, who was interviewed by the Al Jazeera Journalism Review, said journalism and media studies graduates who do not acquire the necessary skills may latch on to superficial manifestations like the latest technology and social media, rather than pay attention to news substance regardless of the platform. “Sadly, there’s a big drop in the command of languages (stressing the importance of mastering several in a globalized world), a shortage of critical thinking, little grasp of general knowledge, not to mention media ethics that’s almost non-existent, and, a problem of accuracy, balance, and verification in light of everything that’s published on social media,” she noted. She said media’s role should be to benefit and enlighten readers, listeners, viewers and browsers, not just owners, adding that Lebanese media are also constrained by political, sectarian and economic factors. Will Lebanese Newspapers Become Extinct? The ax is falling fast on Lebanese journalists as word of newspapers going fully online or facing shutdown spread this week amid a sea of political, financial and social turmoil in the country. Besides sharp drops in advertising revenue, competition from newer local print and online media (not to mention social media and citizen journalists), rising production costs, measly subscriptions, and readers who would rather get their news in snippets on the move, Lebanese media have also been heavily dependent on political patronage and outside funding over the decades. All dailies have online versions but the big question is whether the paper editions would survive. Newsrooms have failed to keep up with the times. There’s no real integration of key elements of digital multimedia newsgathering, editing, distribution and interactivity or engagement with consumers. Editors and publishers exist in bubbles of denial or believe that imitating certain foreign media’s tactics of a race for clicks and unrealistic analytics will help achieve their goals of monetizing online content. 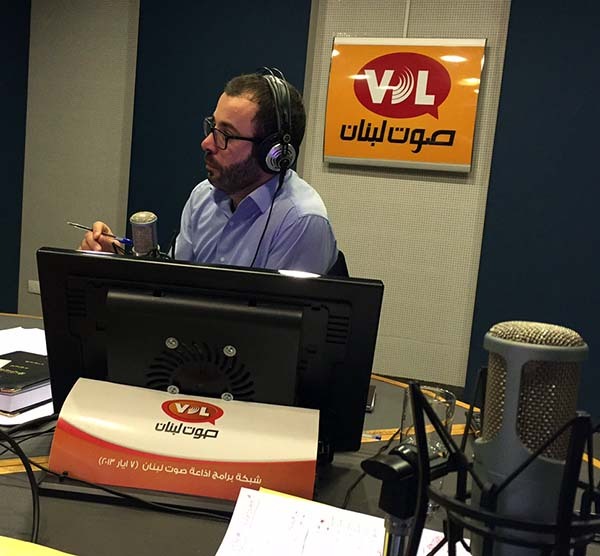 Media Unlimited director Magda Abu-Fadil discussed Lebanese print media’s slippery slope in “Al Safha Al Akheera” (The Last Page), a radio talk show on Voix du Liban, in March 2016. Other guests were Ahmad Zeineddine, a media professor at the state-run Lebanese University, as well as Salah Salam, editor of the daily Al Liwa’ (The Banner) and Rabih Haber, publisher of the online news site Lebanon Files. Journalism education and training in the MENA region need a shot in the arm to ensure graduates and practitioners attain and maintain professional standards, students at the University of Wollongong in Dubai were told. 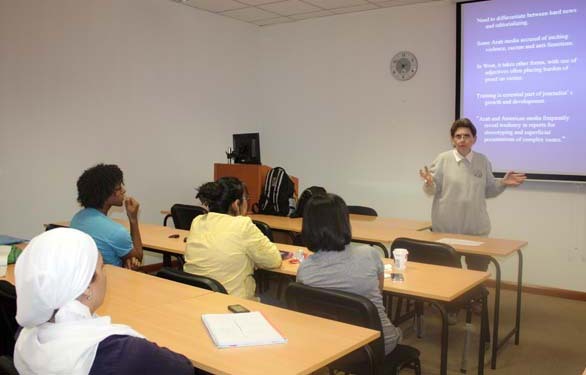 “Journalists are like emergency room doctors,” Media Unlimited director Magda Abu-Fadil said, addressing a joint class of postgraduate students in the Master of Media and Communications and Master of International Studies programs in October 2012. They treat and save (news) patients, work on tight deadlines, can’t afford to make mistakes, and if they do, the results could be catastrophic, she explained. Abu-Fadil said there was often a “disconnect” between what is taught and what the journalism market needs, given the fast-changing landscape, globalized nature of the industry, and introduction of digital technologies in all facets of the profession. On the academic front, Abu-Fadil noted the lack of up-to-date courses, newsrooms and regular student on-campus newspapers, radio and/or TV stations and websites in most Arab countries. “The introduction of online journalism courses has been very slow,” she noted, adding that she had co-authored the UNESCO-sponsored book “Model Curricula for Journalism Education” as a template for developing countries, which is available in nine languages. She lamented the lack of attention to the learning of languages, geography and history, notably for journalists choosing careers as foreign correspondents, and said traditional Arab curricula do not encourage critical thinking. On another front, Abu-Fadil advised the students not to be satisfied with their degrees but to seek regular training to upgrade and update their knowledge and skills. She underlined the importance of ethical media practices, attention to detail, inclusion of context in all stories, and, the importance of integrating multimedia and social media in their coverage. 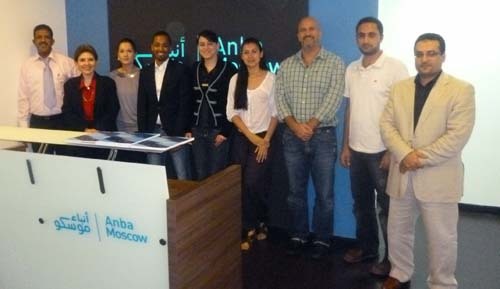 Seven journalists at Anba Moscow’s Dubai bureau underwent intensive training to upgrade their skills for the website maintained in Arabic by the Russian news agency Ria Novosti. The journalists, who come from diverse backgrounds, attended a five-day workshop in October 2012 conducted by Media Unlimited director Magda Abu-Fadil on the needs of an international news agency, evolution of the media, and story structure in an online environment. Also on the agenda was the importance of solid headlines and leads, sources, types of wire stories and integration of social media into the mix for better audience engagement. Abu-Fadil reminded the journalists of the need to maintain high ethical standards in their coverage. They were provided tips on crises, sudden events, fieldwork, means of communication, safety measures and coordination between correspondents and their newsrooms. Not to be overlooked, the Anba Moscow team was encouraged to make good use of infographics, photos, videos and audio clips, and develop interest in multimedia.